In Revel,each product can be assigned a different commission amount. Every time an employee sells a commissioned product, it will be reflected under the commissions report. When a product is sold, the commission value can also be split, adjusted, or transferred amongst different employees. On the Management Console, start by Navigating to the Settings Tab . In the search for settings box, type in Track Commissions. On the right, check the box for this setting, then click Save. Once commissions are enabled, each product needs to be assigned a specific commissions amount. This can either be a specific dollar amount or percentage value. If commission is set to static amount, it will always remain the same regardless of any item discounts. However, percentage will calculate the commission based on the final price of the product after item discount. On the Management Console, select the Products icon. On the products page, select the Pencil icon to access the product details of the desired item. Select the check box for Commission and Commission Type on the left side. Under Commission Type, select Percent or Amount. Then type in the value. If you would like to edit commissions for group of items, you can easily update these items using the Import/ Export feature. Navigate to Products > Import/ Export > Products. In the additional fields box, check Commission and Commission Type. The-n export the file. 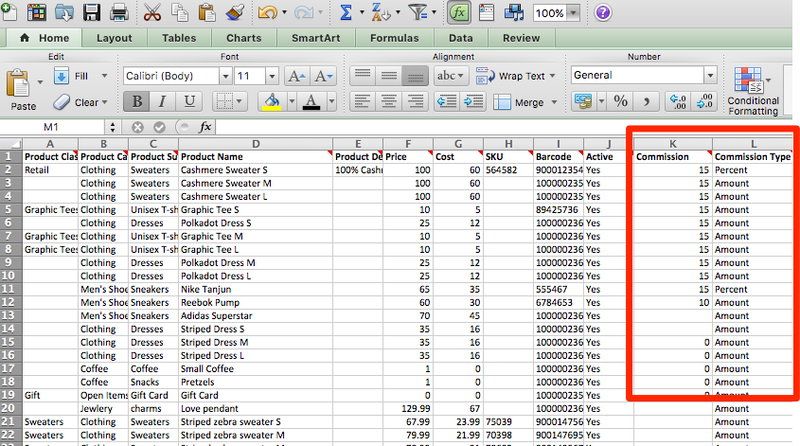 On the excel spreadsheet, fill out the Commission and Commission Type. Save the file, and go back to Products > Import/ Export > Products, and import the update file into the Management Console. When products with commissions are sold, the amount can be displayed on the right side of the screen. This value can either be transferred completely to another employee or split amongst multiple employees. For example if a jacket is sold with $10 commission, $3 can go to the cashier and the rest go to the sales associate. Or the cashier is logged in however all the commission needs to go the sales associate. 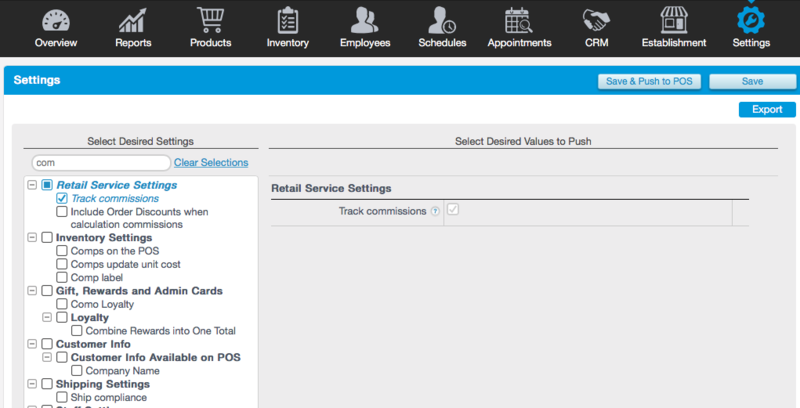 On the Point of Sale, add the commissioned product to the order screen. To open the product details page, tap the Product’s name on the left side of the screen. Tap the Pencil icon to either switch the commission or split the commission between other employees. Under Total Commissions, you will see the value of the commission of this item. To adjust the commission rate, you can tap Transfer, to transfer the commission value to another employee. Or tap Add Employee, to split commissions between employees.